Original Editors -Nick Goulooze & Corey Malone from Bellarmine University's Pathophysiology of Complex Patient Problems project. Gastric cancer (also known as stomach cancer) is characterized by rapid or abnormal cell growth within the lining of the stomach, forming a tumor. There are several different types of gastric cancer. This is because there are different types of cells which make up the stomach. Therefore each particular cell has its own type of cancer. 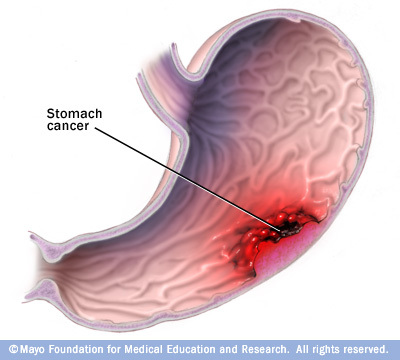 This is the most common type of gastric cancer (95% of gastric cancers). This particular type of stomach cancer originates in the lining of the stomach, and effects the glandular cells of the stomach. It is believed that the majority of stomach cancer cases are caused by Heliobacter pylori bacteria. This type of stomach cancer effects the stomach's hormone producing cells. Carcinoid cells reproduce very slowly, and are incredibly rare. After the cancer has progressed a significant amount, a patient may have symptoms such as flushing of the face and chest, trouble breathing, and diarrhea. This is believed to be caused by hormones from the stomach. This type of stomach cancer originates in the nervous tissue surrounding the stomach, and is very rare. Rarely, cancer will spread from the lymphnodes within and around the stomach, causing gastric cancer. As common with any type of cancer, gastric (stomach) cancer can present in various stages, ranging from mild to severe. Abnormal cells discovered within inner lining (mucosa) of stomach wall, aka carcinoma in situ. A) Cancer has spread to submucosa, which is the stomach layer immediately following the inner lining or mucosa. B) Cancer has invaded submucosa as well as 1-2 lymph nodes near the stomach. A) Cancer may have spread through several layers of the stomach including the muscularis propria (main muscle layer) and subserosa and found in 3-6 nearby lymph nodes. B) Cancer continues to spread through layers of the stomach, potentially reaching all layers. It has invaded 7+ lymph nodes and may have begun to grow in other nearby organs or tissues. A) Similar to IIB, cancer continues to invade layers of stomach and nearby lymph nodes; can involve nearly all muscle layers and a few lymph nodes, or a couple muscle layers and many lymph nodes. B) Cancer growth in nearby organs or tissues really begins to accelerate. C) Cancer has spread through all layers of stomach and 7+ nearby lymph nodes, or cancer has invaded nearby organs and 3+ lymph nodes. Cancer has metastisized to distant organs or body parts. Signs and symptoms tend to arise later in the disease process, time frame is variable. All of these signs and symptoms should be carefully examined by the physical therapist when treating a patient. Also, look for signs of referred pain. The stomach's referral pattern is in the epigastric region, the left upper quadrant, and within the midscapular region. You should stop treatment and refer your patient to a doctor immediately if you recognize a number of these signs and symptoms associated with these areas of pain. A Study conducted by Heemskerk et al investigated associated co-morbidities upon history intake of 235 patients diagnosed with gastric cancer between 1992-2004. There are many medications that are used for gastric cancer, each one prescribed by the patient's physician. Before a specific medication is prescribed to the patient, the physician should go through an extensive overview of the history of the patient, looking for history of allergic reactions to certain drugs. The patient should also be warned of adverse side effects that could effect the patient's everyday activities. Doxorubicin Hydrochloride is used in conjunction with a number of other medications in order to treat a number of cancers including gastric cancer. It is in the class of drugs called anthracyclines, and it works by stopping or slowing the growth of cancer cells in a person's body. Fluorouracil is a type of chemotherapy used in conjunction with other cancer medications which helps to slow/stop the growth of cancer cells. It is in the class of drugs called antimetabolites. Mitomycin is a type of antibiotic only used with patients going through chemotherapy. All of the following tests are done in order to either to diagnose for gastric cancer or to determine what stage the cancer is in, in order to determine the best treatment approach for that patient. Following are a number of diagnostic and special tests. This is a diagnostic procedure involving a thin tube with a camera inside of it that is passed through you esophagus into your stomach. This allows your doctor to find any suspicious tissue within your stomach that should be tested for cancer. If your doctor decides to send stomach tissue off to a lab to check for cancer, this is called a biopsy in which test can be done to determine if the suspicious tissue is malignant or benign. The doctor may check for enlarged lymph nodes, an enlarged liver, increased fluid in the abdomen (ascites), or abdominal lumps felt during a rectal exam. The major surgery that patients with gastric cancer recieve is called a gastrectomy, which is where part or all of the patient's stomach is removed. When this happens, many changes will occur in the patient's diet because their body starts to process food differently. For instance, when the entire stomach is removed, the patient will not be able to absorb the vitamin B12 If this happens, the patient will become anemic, and therefore must recieve injections of B12. The patient must also slowly resume a normal solid diet, starting with intravenous feeding and progressing to solids. Often times these patients also have cramps, nausea, diarrhea, and dizziness shortly after eating because food and liquid enter the small intestine too quickly Finally, bile may back up from the small intestine to the esophagus or the part of the stomach that wasn't removed, and can cause stomach pain. There are many side effects of chemotherapy that can be detrimental to a person's quality of life. The reason being is because the role of chemotherapy is to kill any rapidly dividing cell, not just cancer cells. Therefore, patient's undergoing chemotherapy for gastric cancer can expect to lose there hair. They may also have oral problems such as sores and decreased taste buds. Since the digestive tract is also included in rapidly dividing cells, patients may also have digestive problems including stomach aches, nausea, vomiting and loss of appetite. Probably more importantly than all of this, though, the patient's immune system is often compromised due to the chemo's nature to kill off red and white blood cells. Radiaton has very similar side effects to chemotherapy. On top of this, it can cause patients to develop skin problems such as rashes and easier cuts. Patients can also expect to be extremely fatigued during their radiation treatment. Medical management of stomach cancer is dependent on its stage. The most common form of intervention is surgery, mainly emphasizing removal or part or all of the stomach. Radiation or chemotherapy may also be indicated should the cancer have metastisized to lymph nodes or other structures. Three common surgical interventions include endoscopic mucosal resection, subtotal (partial) gastrectomy, and total gastrectomy. Endoscopic mucosal resection is indicated when the cancer has not spread beyond the inner lining of the stomach. The surgeon removes the cancerous cells via a long tube which travels down the esophagus and into the stomach. A subtotal or partial gastrectomy is when only part of the stomach is removed. In this case, the cancer has spread significantly to the point in which it cannot be treated endoscopically. In addition, this procedure may involve the removal of a portion of the esophagus, small intestine, or nearby lymph nodes. A total gastrectomy is when the cancer has invaded the entire stomach and it needs to be removed completely. Patients that have underwent a total gastrectomy must eat more often and in very small amounts. Palliative treatment is often times indicated for patients in the severe stages of gastric cancer (III and IV). The cancer has invaded the body to the point where a complete cure it is difficult. Palliative treatment aims to subside the effects of cancer as much as possible without actually curing it. For example, a stage III or IV tumor can put pressure against the esophagus, making it difficult to eat. A palliative treatment technique for this may involve the placement of a stent in the esophagus, or lazer beam therapy to vaporize that portion of the tumor. Catholic University in Washington, D.C. recently conducted a study in which records of 232 patients with gastric cancer between the years of 2007-2011 were retrospectively studied. The patients were all admitted at the Bugando Medical Center in Tanzania during this four year period. The most common surgical intervention which accounted for 223 of the patients was a gastro-jejunostomy. This is a procedure in which an anastamosis is made with the stomach and the second part of the small intestine or jejunum via a small tube. Normal function of the outlet from the stomach into the first part of the small intestine (duodenum) is compromised due to the cancer. A gastro-jejunostomy is a form of palliative treatment to allow for proper transition of foods or medications from the stomach to the intestine. Since lymphoedema can occur in conjunction with gastric cancer treatment, lymphatic drainage may be indicated. Since physical therapists are certified to perform lymphatic drainage, it is their responsibility to try and minimize the effects of lymphoedema. It is important for patients undergoing cancer treatment to stay active. Exercise during cancer treatment can help to minimize fatigue, improve a patient's immune system, reduce the effects of bed rest (such as contractures and muscle atrophy) and increase general quality of life. Physical therapy should be utilized during cancer treatment to help a patient maintain function and to prevent the effects of bed rest. However, some people may choose not to go through PT because of fatigue or pain. After cancer treatment, though, patients can go to physical therapy to try and reverse some of the side effects of treatment, and to try and regain function that may have been lost after cancer treatment. Vascular changes with a slight increase in type III collagen deposition on healing. ↑ "Gastric Cancer; Report Summarizes Gastric Cancer Study Findings from Catholic University." Medical Devices & Surgical Technology Week (2013): 454. ProQuest Nursing & Allied Health Source. Web. 14 Feb. 2013.